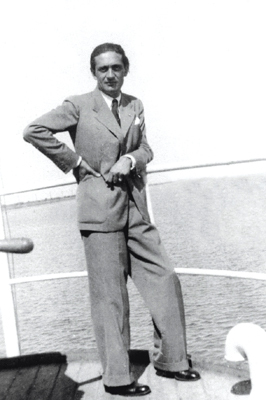 Guglielmo Ulrich was born in 1904 in Milan, to a notable family of Danish descent, which is perhaps where he first developed his meticulous taste and appreciation for elegance and refinement. In 1924 Ulrich enrolled in the Scuola Speciale di Architettura, the architecture programme at the Accademia di Belle Arti di Brera. He finished his studies at Politecnico di Milano in 1927, and soon became a seminal figure in the world of Italian design. He was an architect, a designer and a painter, and his work played a formative role in what we recognise today as Italian style. It was not long before Guglielmo Ulrich's name became synonymous with innovative and impeccably accomplished work. 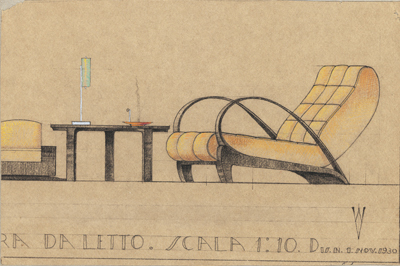 Milan at the time, described by contemporary Italian architect Luca Scacchetti as 'the Italian laboratory of modernity', was the backdrop to Ulrich's creative journey. It was during the period between the two World Wars that the city established its position within the world of architecture, creating a new basis for the neoclassical style at the beginning of the 20th century. After World War II many buildings and apartments were demolished, resulting in redesigns and a radically different architectural facade compared to those of Rome and Florence, famed for their flamboyant and opulent architecture. Scacchetti describes Ulrich as an extraordinary mirror of a changing culture, reflecting a more measured and elegant world where a balance was struck between quality and good taste. Exposing too much was considered extremely vulgar with a more muted display and appreciation of luxury becoming widely accepted. 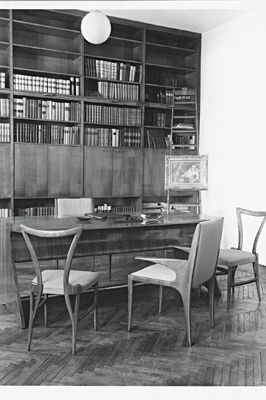 Ulrich was admired by his contemporaries, in particular by Gio Ponti, the architect and founding editor of Domus magazine.Â Ponti, a fellow Milan citizen, was an artistic director and designer. In 1928 he founded Domus and quickly established it as Europe's most influential architecture and design journal. Ponti was renowned for his blending of the old and new in his work. In the late 1940s he began a four-year commission restoring Italian cruise liners. Like Ulrich and Pulitzer, Ponti developed a definite predilection for naval designs. 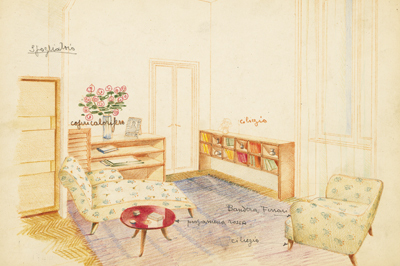 In 1930 Guglielmo Ulrich founded the ARCA - Arredamento Casa - the house furnishing company with Altilio Scaglia and Renato Wild and, after the studios were destroyed during World War II, he continued to collaborate with other designers and artists including the architect Gustavo Pulitzer. 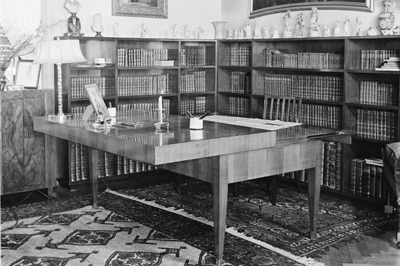 Pulitzer was also a well-recognised figure in Italian design; a man who, like Gio Ponti, specialised in designs for luxury Italian cruise ships. Pulitzer was a master of combining indulgence and refinement with functionality and modernity, further contributing to Ulrich's blend of beauty and practicality. were held together transversally; a method that demonstrated a new technical achievement and something that would become the trademark of Ulrich's sophistication. Though of the time, his work is not always easily recognisable as being from the period in which it was conceived. 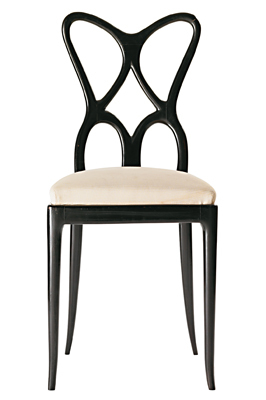 Ulrich reinvented traditional 18th- and 19th-century sophistication in a form combining contemporary comfort and panache. 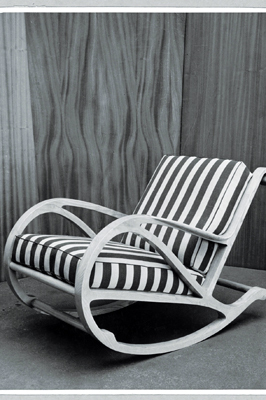 His evolutionary technique is perhaps most evident in his many progressive chair designs while other more autonomous pieces would be developed into a series of variations on one theme. Ulrich, however, was not without his detractors. Fellow architect Melchiorre Bega publicly berated him for only creating pretty variants of antique chairs rather than original creations. In his defence, Scacchetti identifies a new modern language within Ulrich's work where historical influences are juxtaposed with contemporary thinking to establish tradition. I'm not so sure this is a unique trait as we might also attribute Shaker or Arts and Crafts methods of construction in our own work as variants. 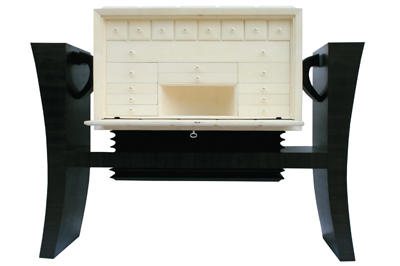 Nostalgia, whether intentional or not, has always been a popular concept for furniture designers, keeping a minimum safe distance of around two generations, and although Ulrich's designs have echoes of the 18th century they stand out in their own right with large legs and a strong sense of volumetric mass. But the work he is known best for represents his eternal search for slenderness. As a consequence of his cultural heritage, Ulrich adopted an a-chronological use of history; specified by Scacchetti as the frequent references to the chinoiserie of his early career and of his later, more mature recollections of the Chippendale style. 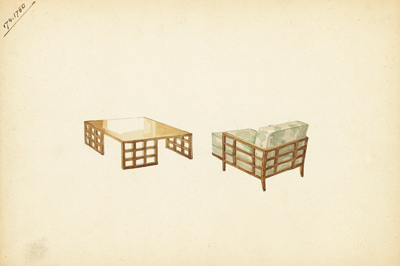 Amidst this diversity runs a commonality that is recognisable in each of his designs. They are modern, clean and certainly adhere to a definitive style. 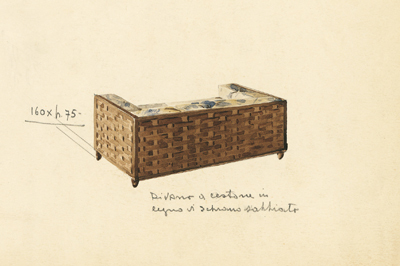 By the 1940s, there was a strengthening of the relationship between interior decoration and new artistic disciplines, which played a large role in the future of Italian design in the period after War War II. As a new observer to Ulrich's work, it's interesting to think that while Northern Europe and the United States were in the thralls of a Scandinavian invasion of pared-down modernity, Milan, the style capital of the Western world, was in the grips of a revivalist movement and somewhat out of step contributing a softer, playful edge to what we term 1950s style. With most influential designers their signature piece is typically an item of seating and in Ulrich's case it was the chaise longue. Essentially he exploited and incorporated the fact that the chaise longue had begun to represent a form of modernity through its strong association with a decadent past. From my own experience I can say that a chaise is one of the most rewarding pieces of furniture to make until you come to sell it. How many of us, however tempting it might be, can cope with the radical social dynamic that it brings to the home. Maybe it's the vulnerability of the prone position or connotations with the psychiatrists' couch that make it a hard sell but either way you won't find that many on the high street. For the majority of Ulrich's work the common theme is that his furniture is deliberately visible against the backdrop of the room. It is not supposed to blend in; subtlety was not a priority or even a consideration when it came to most of his designs. Except, that is, for his bench seats which were designed to follow the profile of the room in which they were placed. Scacchetti claims that Ulrich's 1934 goatskin bench should be counted among the most beautiful pieces of the 20th century. As a result of its popularity, the bench was put forward by Matteograssi, the Milan- based design and manufacturing company, in 1996. Although Ulrich's furniture is the main focus of our attention, no assessment of his contribution to the interior landscape would be complete without acknowledging his designs for lighting. Hundreds of sketches exist of wall-mounted fixings, desktop and pendant lamps, not all of which made it into production. But like any truly great designer the concepts are strong and given his track record are just a few strokes away from coming to life. Like a Ferrari or Riva speedboat, Italian design has a habit of making completely irrational and unnecessary objects compelling and acceptable in a way that transcends judgement and poor taste. Ulrich's contribution, however, represents something more attainable: intelligent design for anyone clever enough to spot it. Guglielmo Ulrich died in 1977 and was buried in his family tomb in Besana, Brianza.